As the first Place on Avenyn, we are very proud to have 12 Grand Champion Shuffleboard tables (22' Nordic Edition Shuffleboard). Briefly, the objective of the game is to slide, by hand, all four of one’s weights alternately against those of an opponent, so that they reach the highest scoring area without falling off the end of the board into the alley. This is a fun game to play with friends, a big group, colleagues, or your family. If you only want to book Shuffleboard, this costs 430 kr per table and hour, you can choose how many hours you want to book and how many people you want to play on a table. Our recommendation is that there are four players on a table and two in each team. Like so many other games Shuffleboard were invented in England, a long time ago (1500s). It was developed in the US and is available in two different variants. Shuffleboard on deck ship, known by many Hollywood films and television series, played with a kind of rake (queue) or the modern Shuffleboard played on a 6.7 meter (22 am.foot) and 65 cm wide table games. 2010 Century success started at the bar Tilt in central Oslo. From there it quickly spread further in the Nordic region and in Europe. 1. Each player / team has four weights - red or blue. 2. The first player / team who first reach 15 points win. 3. The first player slides his first weight toward the opposite end of the board, which becomes the scoring end. His opponent then shoots his first weight in a similar manner, attempting either to knock off the other player’s first weight, or to outdistance it. The players continue shooting their weights alternately, until all eight weights have been shuffled. When this has been done, one round of play has been completed. 4. The player whose leading weight is farthest down the board (away from the players) is the winner of the round. Only one team scores per round. The winner’s score is then totaled and registered on the scoreboard. 5. A puck must be completely in a score zone to count. 6. A winning puck that extends over the far edge of the board is called a “hanger” and counts as 5 points. 9. Any puck that crosses the foul line closest to the shooter is considered a legal shot and will remain on the board throughout the round. 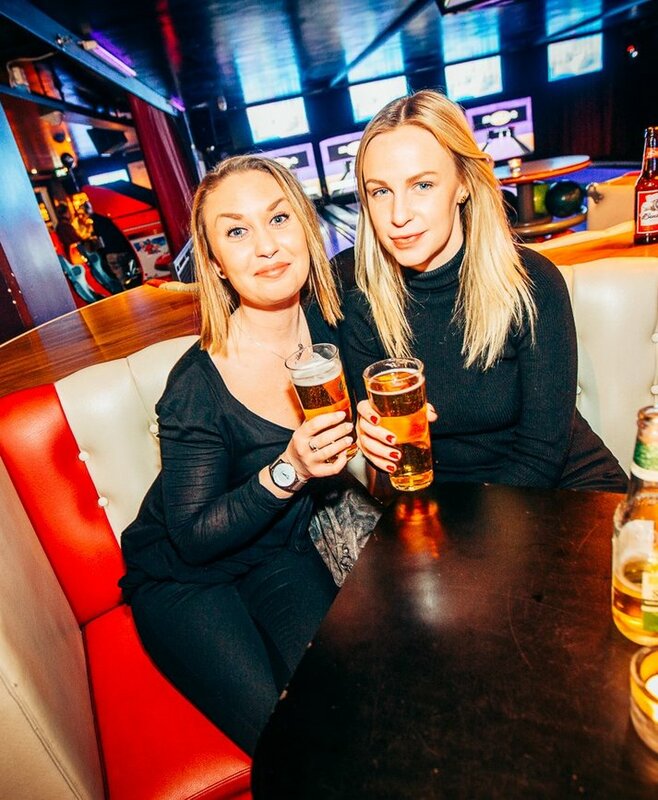 At our fourth floor we have our sportsbar were you can enjoy with your friends and watch games, play shuffleboard or just have a beer and enjoy the atmosphere. WE LOVE MUSIC, but we also love sports. We offer four large screen monitors on four different floors and several smaller screens throughout the house. Interested in a special game? Please do not hesitate to contact our restaurant for more information. Booking: 031 10 23 30 It is also possible to book a private room or space if you wish to book for a large group and watch sports, we will gladly provide you with more information! In the sports bar there is always some kind of sport to watch, hang in the bar or play some of our pinball games.